In a digitally-crazed city that never stops moving, one New York photographer reveals that everyone from pop stars to the homeless still gets lost in print. Back in the early ’70s, probably 1971 or 1972, I picked up a copy of André Kertész’s On Reading, which had recently been published. I was impressed by, and a bit envious of, his black-and-white photographs of people in different cities around the world, all in the act of reading. A bookseller in Union Square, at 17th Street near Broadway. 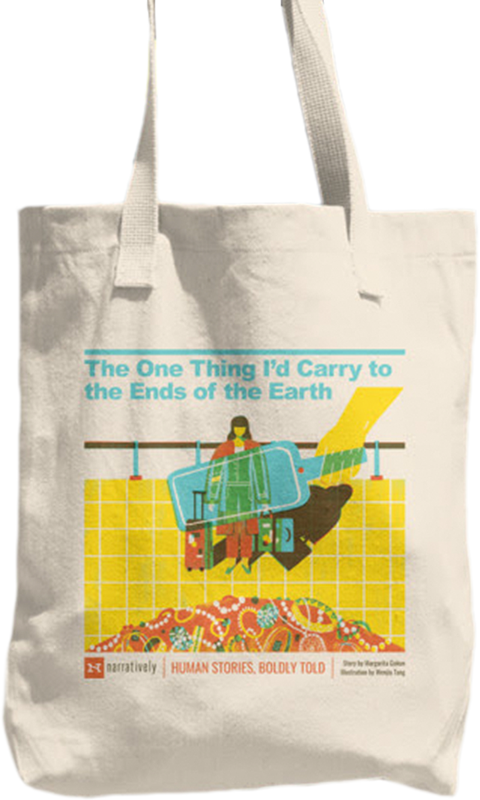 I was a voracious reader then and I loved to walk—to take “grand obsessional walks,” to quote Henry Miller—across Manhattan. And I was always observing, eavesdropping, stopping at a café or the long counter of a coffee shop now and then to read James Baldwin, Knut Hamsun, Kafka, Jack London and the short stories of Isak Dinesen. Woody Allen peruses a copy of Helen Vendler’s “Last Looks, Last Books” as he strolls on East 59th after dropping off his wife, Soon-Yi, at Prada. A woman reads a book on the #3 subway train. Much later, in the early ’90s—still reading a lot, mostly short stories and prose poems—I began to photograph (as an amateur) poets and writers at reading events around the city—Allen Ginsberg, Gwendolyn Brooks, Denise Levertov and others. I received some encouragement and picked up a better camera. After a few weeks my first published photo ran on page one of the New York Times—a “weather photo” during a heat wave on July 10, 1993. A few weeks later the New York Post ran a celebrity photo of mine (Marisa Tomei made up to look pregnant on the film set of “The Paper”) and for the next twenty years I worked as a freelance photojournalist. A New York City bus driver reads a book during a break on Greenwich and Warren Street in Tribeca. A man reads about the preacher Richard Allen with the help of a magnifying glass. A street book vendor on the Upper West Side gets engrossed in one of his own books for sale. 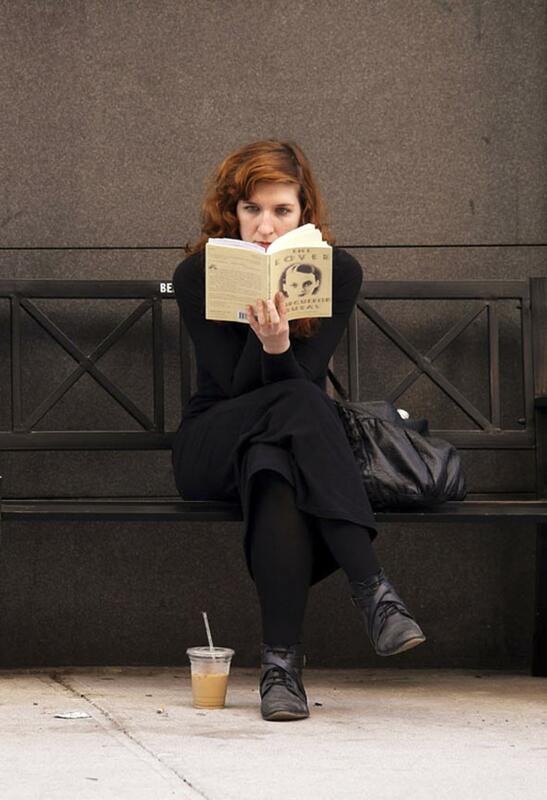 A woman reads on Mercer Street in Soho. 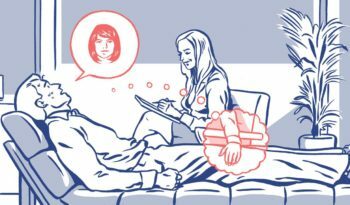 Since then I have continued to seek out readers—despite (and sometimes because of) the shuttering of bookshops and the rapid growth of the web and impersonal electronic reading devices. I discretely photograph my subjects—mostly solitary and often eccentric, desperate, dignified or vulnerable—engaged in what seems to be a vanishing art—the art of reading. Actor and comedian Zach Galifianakis reads Corina Copp’s “Pro Magenta” in Union Square Park. Zach was in the park to film a “Funny Or Die” spot. All of these images are candid, with the exception of Dustin Hoffman, Woody Allen and Zach Galifianakis. In each of those impromptu photos, I requested the celebrities to pose with a book. A shirtless man on the Brighton Beach boardwalk reads two books. A man reads a book while pushing a stroller on 12th Street near Third Avenue. 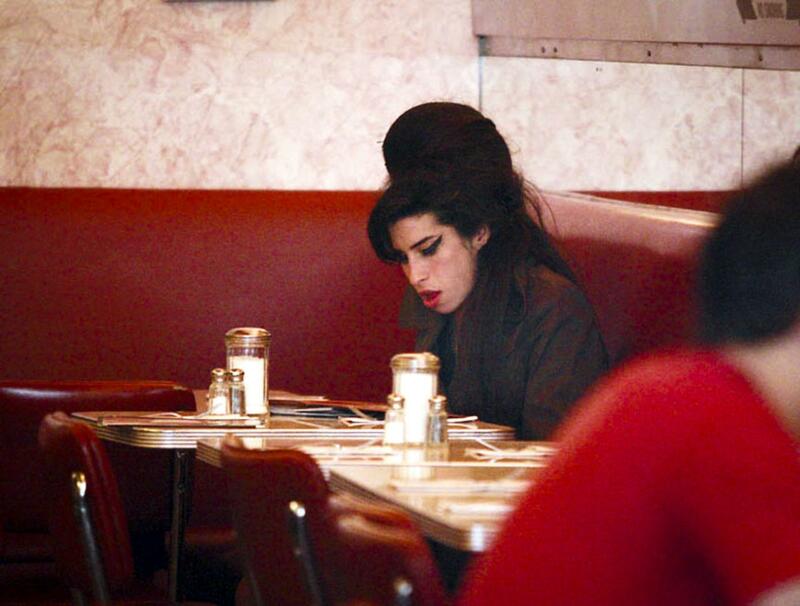 The late singer Amy Winehouse at the now-bygone Florent restaurant on Gansevoort Street. Dylan Spoelstra from Toronto, Ontario, reads Allen Ginsberg’s “Reality Sandwiches” at Zuccotti Park during Occupy Wall Street protests. A woman browses books at Strand Book Store. 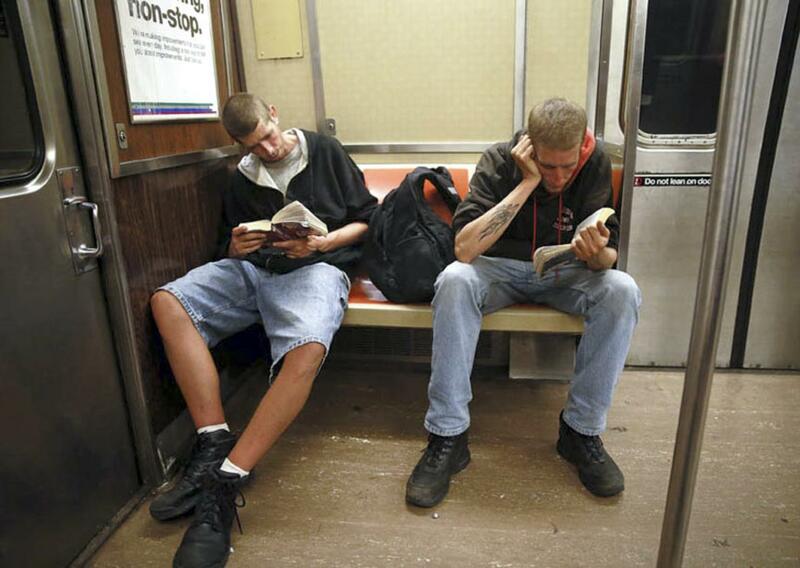 Two brothers read on the R train. 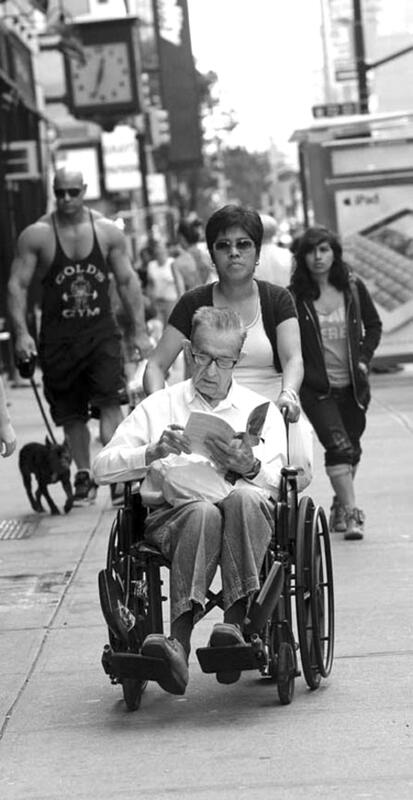 A man in a wheelchair reads a book while a bodybuilder walks his dog behind him on Amsterdam Avenue. A woman reads “The Lover” by Marguerite Duras on East 12th Street. 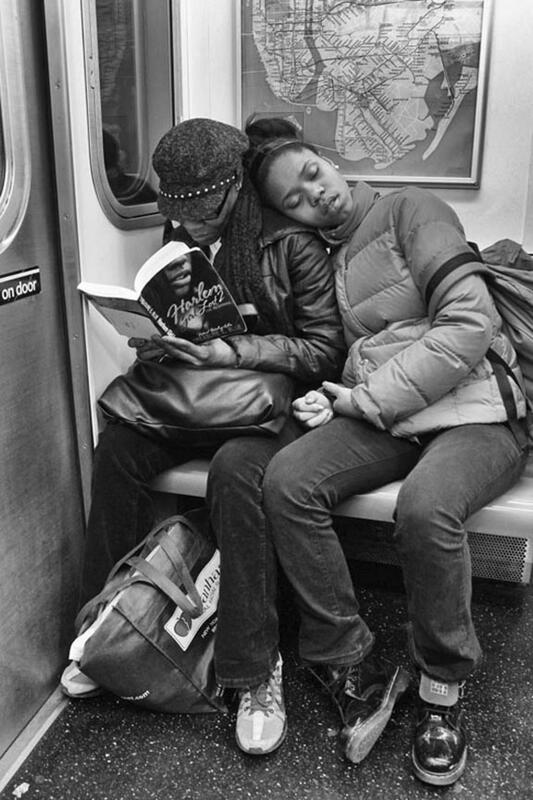 A woman reading on the #2 train while her daughter slumbers beside her. All photos ©Lawrence Schwartzwald, 2013. No reproduction without express permission. Lawrence Schwartzwald’s images are available for license via Splashnews/Corbis.